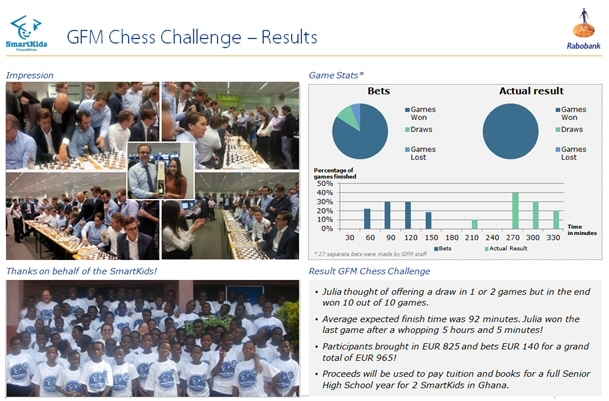 Rabobank Chess Challenge On 4 December 2014 a chess challenge was organized by a group of Rabobank Trainees. Julia, a 24 year old Chess Master competed against 30 Rabobank employees of all ages in 10 simultaneous games. After a marathon match lasting more than 5 hours, with some very close matches, the chess prodigy won all the games. In total almost EUR 965 was raised for the SmartKids Foundation. The SmartKids Foundation would like to thank Rabobank, the organizing committee, the sponsors and of course Julia for organizing this great event, creating awareness of the SmartKids Foundation and raising the funds! Please see below an impression of the great atmosphere and an overview of the match results.